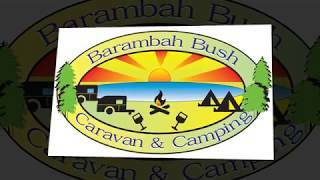 Barambah Bush Caravan and Camping Park is in the beautiful South Burnett Region of Queensland. Experience 200 acres with 60 acres of parkland and 140 acres of natural bushland. Enjoy the peace and serenity of the Bush and enjoy the many species of birdlife and native animals that reside on the property. Clean, spacious amenities, camp kitchen, laundry, free gas barbecues, wood fire barbecues, campfires to sit around, cook in the camp oven, or toast marshmallows. Camp right beside one of their dams, on powered or unpowered sites. They have powered and unpowered sites, camp sites and drive through sites as well as cabin accommodation. There is excellent television and phone reception and free wi-fi. Rest and relax in their well maintained and landscaped park. It's only a short drive to their local wineries and many of the South Burnett’s tourist attractions. They are 2.5 hours from Brisbane, two hours from the Sunshine Coast and Hervey Bay and six kilometres from Murgon. 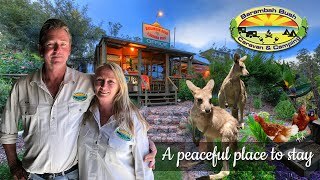 Experience the Barambah Wine Trail where you can experience the beautiful wines of the South Burnett from any of their three wineries. Group/Club bookings are welcome and well behaved pets are accepted on their caravan and camping sites. The ensuite cabin has reverse cycle air conditioning, refrigeration, television/dvd player and cooking facilities. All blankets, linen, towels and pillows are supplied. Standard cabins have reverse cycle air conditioning, refrigeration, television/ dvd player and cooking facilities. All blankets, linen, towels and pillows are supplied. The powered sites are peaceful, shady sites, most with slab and close proximity to amenities block. Water and sullage is available at each site. Shady sites with camp fires nearby. Short distance to amenities and camp kitchen.